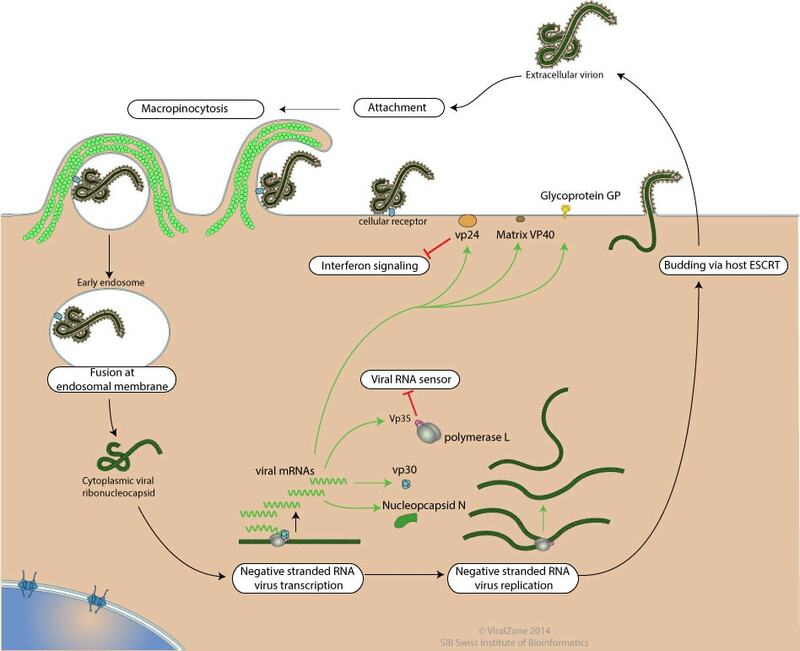 Ebola Virus do not replicate through any kind of cell division; rather, they use a combination of host and virally encoded enzymes, alongside host cell structures, to produce multiple copies of viruses. These then self-assemble into viral macromolecular structures in the host cell. The virus completes a set of steps when infecting each individual cell. First of all, there is attachment of virus to host receptors through GP glycoprotein which is endocytosed into vesicles in the host cell. Host DC-SIGN and DC-SIGNR play a role in virion attachment. The virion enters early endosomes by Macropinocytosis or clathrin-mediated endocytosis. In this process, ruffled segments of the host’s plasma membrane protrude outward from the cell and form invaginations where the virus utilizes glycoproteins in order to attach to the surface of the plasma membrane. Macropinocytosis is a process in which the Eukaryotic host cells form macropinosomes, segments of plasma membranes that extend out from the cell approximately 0.2-10 µm, in order to incorporate the virus into the cell. The formation of macropinosomes occurs spontaneously, as a result of the activation of various growth factors, or simultaneously with the intake of cellular molecules or extracellular fluid. Clathrin-mediated endocytosis is the other means by which Ebolavirus enters the host cell. This process is very similar to macropinocytosis in that the plasma membrane forms invaginations that engulf the cell. However, clathrin-mediated endocytosis is different in that proteins on the surface of the host’s surface, and in particular clathrin, facilitate the attachment of the virus to the host’s cell surface. Glycoproteins are still used to attach the virus to the cell surface, and the NP-C1 cholesterol transporter still facilitates the fusion of the virus with endosomes and lysosomes and still allows the virus to escape into the cytoplasm. Without the NPC1 cholesterol transporter, Ebolavirus cannot leave the vesicle in order to replicate and cause infection in other cells. To penetrate the cell, the viral membrane fuses with vesicle membrane, and the nucleocapsid is released into the cytoplasm. In some culture cells, GP glycoprotein can be processed by host Cathepsin L andCathepsin B into 19kDa GP1. But this processing is not happening in all cells or for all ebolavirus. 19kDA GP1 interacts with host NPC1, which is highly expressed in dendritic cells. Fusion of virus membrane with the vesicle membrane is triggered by either low pH or NPC1 binding. During transcription, the RNA genome is transcribed into seven monocistronic mRNAs whose length is determined by highly conserved start and stop signals. The transcription process begins with the binding of the polymerase complex to a single binding site located within the leader region of the genome. The complex then slides along the RNA template and sequentially transcribes the individual genes in their 3’ to 5’ order. Encapsidated, negative-sense genomic ssRNA is used as a template for the synthesis (3′-5′) of polyadenylated, monocistronic mRNAs and, using the host cell’s ribosomes, tRNA molecules, etc., the mRNA is translated into individual viral proteins. The newly formed nucleocapsids and envelope proteins associate at the host cell’s plasma membrane; budding occurs, destroying the cell. These viruses recruit components of the cellular ESCRT (endosomal sorting complex required for transport) system to mediate host-assisted viral budding. SCRT complexes are normally used by the cell for biological functions involving membrane remodeling, such as intraluminal vesicle formation, autophagy or terminal stages of cytokinesis. The ESCRT family consists of ESCRT-0, ESCRT-I, ESCRT-II which are primarily involved in cargo sorting and membrane deformation, and ESCRT-III which cleaves the bud neck from its cytosolic face . In the last step, vps4 disassembles the complex. The budding reaction catalyzed by the ESCRT machinery has reversed topology when compared with most other budding processes in the cell, such as endocytosis and formation of transport vesicles. Finally, the virion is released. What are the preventive measure against ebola virus?